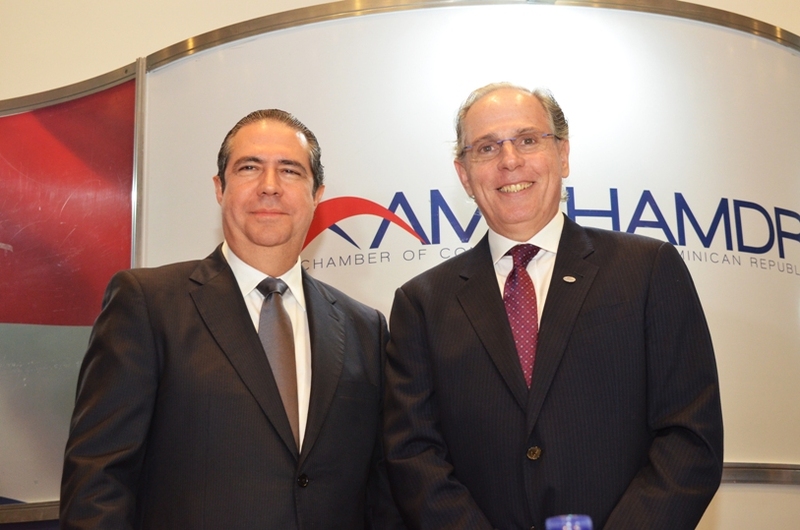 Santo Domingo.- David Fernandez, who was recently elected to head American Chamber of Commerce (AMCHAMDR) during the 2017-2018 period, thanked the Chamber members for their trust, stressing his commitment and identification with the institution and its values. “The vision and mission of the Chamber have made interesting turns, and as part of this new business generation that advocates for the strengthening of bilateral trade and a healthy investment climate, I’m aware that the current context presents its challenges and opportunities,” said Fernandez, who has more than 20 years of experience in business, finance and consultations. Tourism minister Francisco Javier García was guest speaker at the AMCHAMDR’s monthly luncheon, where business leaders and government officials gathered in the Hotel Catalonia Wednesday. Garcia dictated the conference “Sustainability of Dominican Republic’s Tourism Industry,” in which he hailed the ‘PreClearance’ program recently inaugurated at Punta Cana International Airport, which in his view is ‘added value’ for the sector.